This is a list of verifiable roadside attractions. Items can claim to be the largest, longest, highest, or anything that makes them notable. The Big Nickel is a 9-metre-tall (30 ft) replica of a Canadian nickel. 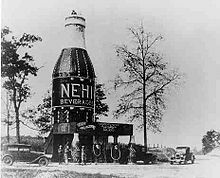 Built in 1924, The Bottle, also known as the Nehi Inn, was one of the first "world's largest" roadside attractions. Despite the attraction itself being destroyed by fire in 1933, the community of The Bottle, Alabama still bears the name of its famous attraction. The Largest Fork, standing 35' and weighing 11 tons in Springfield, Missouri. Salem Sue, claimed to be the world's largest Cow, New Salem. world's largest horseshoe crab, Blanchester. The World's Largest Musky, at the National Freshwater Fishing Hall of Fame; Hayward, WI. ^ "The world's largest roadside attractions". 4 February 2016 – via www.telegraph.co.uk. ^ "WOINIC.fr". Archived from the original on 8 September 2012. Retrieved 27 August 2012. ^ Culbert, Terry (1995). County Roads: Around Ontario with Global Television's Terry Culbert. GeneralStore PublishingHouse. p. 17. ^ "Big Things in a Small Town". October 2016. ^ "World's Largest Collection of World's Smallest Versions of World's Largest Things Traveling Roadside Attraction and Museum". Retrieved 2012-03-09. ^ "Eartha, The World's Largest Revolving and Rotating Globe". Retrieved 2014-03-09. ^ "About the Uniroyal Giant Tire" (PDF). Uniroyal Tires. Archived from the original (PDF) on 30 June 2015. ^ "Traverse City, MI - World's Largest Cherry Pie Pan". www.roadsideamerica.com. Retrieved 2009-04-24. ^ Kristina_5 No real name given + Add Contact. "World's Largest Pie Pan | Flickr - Photo Sharing!". Flickr. Retrieved 2012-08-13. ^ "Former Worlds Largest Cherry Pie Pan | Flickr - Photo Sharing!". Flickr. Retrieved 2012-08-13. ^ "Holland, MI - Michigan's Largest Picnic Table". Roadsideamerica.com. Retrieved 2012-08-13. ^ Kristina_5 No real name given + Add Contact. "World's Largest Picnic Table | Flickr - Photo Sharing!". Flickr. Retrieved 2012-08-13. ^ Kristina_5 No real name given + Add Contact. "Big Ernie | Flickr - Photo Sharing!". Flickr. Retrieved 2012-08-13. ^ Kristina_5 No real name given + Add Contact. "Big Gus | Flickr - Photo Sharing!". Flickr. Retrieved 2012-08-13. ^ Kristina_5 No real name given + Add Contact. "Cross in the Woods | Flickr - Photo Sharing!". Flickr. Retrieved 2012-08-13. ^ Kristina_5 No real name given + Add Contact. "Worlds Largest Lugnut | Flickr - Photo Sharing!". Flickr. Retrieved 2012-08-13. ^ Kristina_5 No real name given + Add Contact. "Worlds Tallest Indian | Flickr - Photo Sharing!". Flickr. Retrieved 2012-08-13. ^ "Kansas City, MO - World's Largest Shuttlecocks". RoadsideAmerica.com. Retrieved 2019-02-25. ^ "World's Largest Shuttlecocks". Atlas Obscura. Retrieved 2019-02-25. ^ "Lucy the Elephant". www.roadsideamerica.com. February 7, 2017. Retrieved February 7, 2017. ^ "The Berry Patch". Retrieved 2014-03-09. ^ "World's Largest Basket, Newark, Ohio". RoadsideAmerica.com. Retrieved 2019-02-25. ^ Lewis, Danny. "The World's Largest Picnic Basket Faces an Uncertain Future". Smithsonian. Retrieved 2019-02-25. ^ "Ohio's famous basket building finally sold". Archpaper.com. 2018-01-04. Retrieved 2019-02-25. ^ Polen, Jenna (2012-06-06). "Cuckoo clock brings more than a new time to Sugarcreek". Bargain Hunter, Holmes County Edition. Retrieved 2014-07-16. ^ "Grants Pass Caveman, Grants Pass, Oregon". Roadsideamerica.com. Retrieved 2012-08-13. ^ "Oregon Corndog history reaches new height with 30-foot Pronto Pup (Column)". ^ "Big Blue Bug – Pest Control in Providence". Retrieved 2014-03-09. ^ "Logan, UT - World's Largest Fishing Fly". RoadsideAmerica.com. Retrieved 2015-10-12. This page was last edited on 9 April 2019, at 15:57 (UTC).